TITE SEAL Is a self-adhesive, rubberized asphalt waterproof flashing material. Its aluminized surface acts as a UV stabilizer, allowing exposure to sunlight for up to 180 days before needing to be covered. INTENDED USE: TITE SEAL is an ideal moisture seal around windows for both new construction and replacement applications. 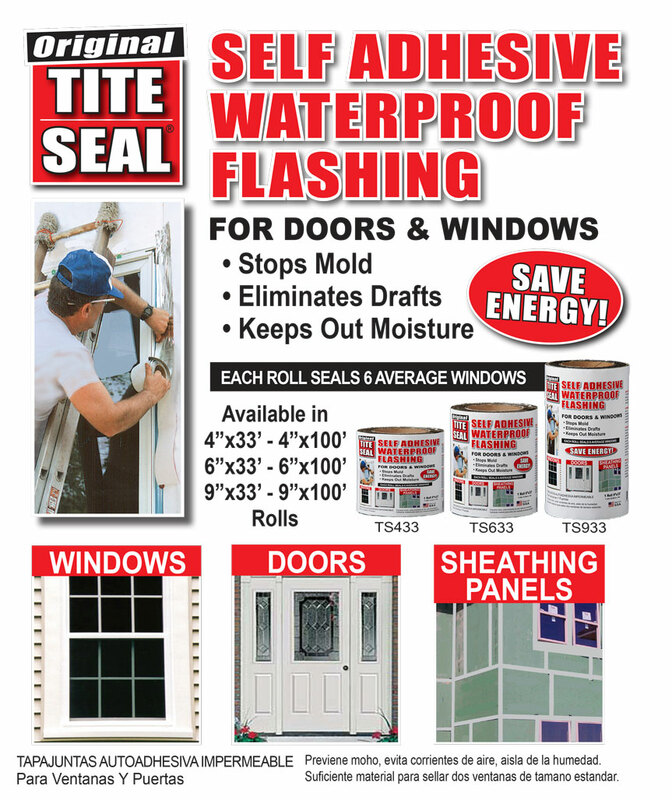 TITE SEAL can also be used as an underlayment to seal joints and other openings under brick, siding, stucco or wood. It can be installed at sills, heads, chimney shoulders, parapets or anywhere a waterproof seal is needed. SURFACE PREPARATIONS: TITE SEAL can be applied to both vertical and horizontal surfaces including wood, composition wood panels,metal, vinyl and masonry. The surface must be clean, dry and free from oil, grease or debris. Dirty, dusty or weathered surfaces should be primed as necessary with a water, polymer,or solvent-based primer to obtain a smooth clean surface. Some wood composition panels may require priming. TITE SEAL should be installed when temperatures are 35°F or higher. If applied in cool weather, the rolls should be stored in a warm place until needed, and a heat gun used to warm the substrate and overlap. INSTALLATION: Just remove the release paper and press in place. TITE SEAL can be cut with a scissors or utility knife. Roll seams with a hand roller to ensure uninterrupted contact. To ensure that moisture flows over the laps, start at the bottom and work up. Side strips should be installed next and should overlap the bottom strip. The head of the window should be completed last. All overlaps should be four inches. Test adhesion with a small piece of TITE SEAL. Do not install without proper adhesion. Use caution to avoid falls when using ladders or scaffolding. When using TITE SEAL, the additional use of caulk is not necessary for the proper sealing of windows. Do not apply TITE SEAL over uncured caulk. Never apply over silicone-based caulk, whether cured or uncured. LIMITED WARRANTY: COFAIR warrants this product to be of merchantable quality when used and/or applied in accordance with instructions hereon. COFAIR does not warrant this product for any purpose or use other than the general purpose for which it is intended. Liability under this warranty is limited to the replacement of defective product as purchased. THIS LIMITED WARRANTY IS ISSUED IN LIEU OF ALL OTHER EXPRESSED AND IMPLIED WARRANTIES,INCLUDING THE WARRANTY OF FITNESS,AND EXPRESSLY EXCLUDES LIABILITY FOR CONSEQUENTIAL DAMAGES.